Over the years of experience in the industry, we have been able to provide the customers with a commendable assortment of Industrial Pulley. Robustly constructed as per the established quality standards, the range is widely demanded in diverse large scale sectors for transferring material from one place to another. Our range is widely appreciated by the clients for high strength, excellent load bearing capacity, dimensional accuracy, trouble free performance and minimum friction factor. Owing to the adroit professionals of our firm. 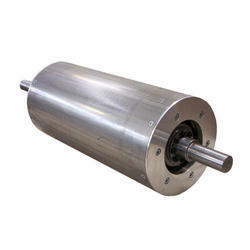 We have been able to cater the clients with Magnetic Pulley. The product enables to separate the unwanted material and disposing them to a attached receptacle. Provided with a powerful magnets, these products are available to the clients in longitudinal polar field distribution and lateral polar field distribution for extraction of low & high level iron contamination respectively.